It's not for the faint of heart, but if you're the sort of person (like me) who read Anandtech's reviews purely for the numbers, then this is very much your jam. Especially given that Anandtech hasn't done any of its amazing phone reviews in quite some time. The very short version is that the Pixel 2 XL has a mostly well-calibrated display, though there are a few interesting quirks such as a tendency to be a bit colder than ideal and a gamma target that could be a bit improved. 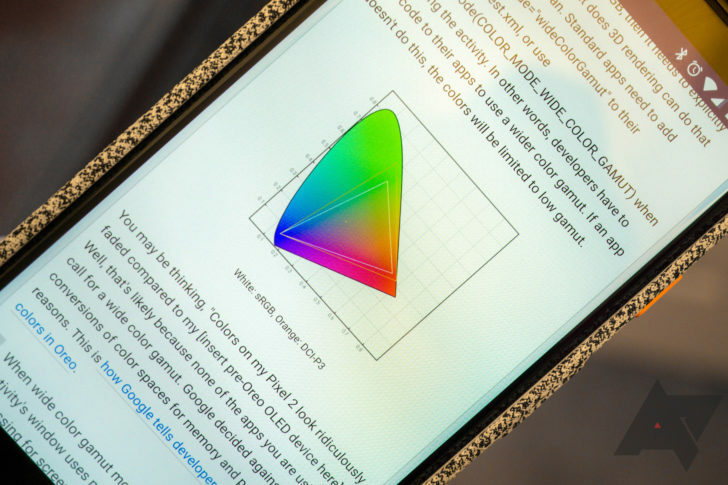 But against other displays, the Pixel 2 XL's color calibration holds its own. I'd also recommend that you take a look at our coverage on how Android 8.0 Oreo handles color, as it meshes pretty well with XDA's coverage to better expand your understanding. There's also a video on the subject from this year's I/O that I bring up pretty much any time we discuss color in Android, and it's worth watching as well.